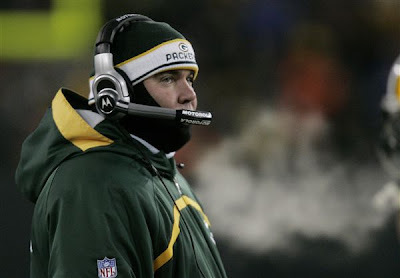 Coach Mike McCarthy is cold but not happy. Remember, it was below zero with a wind chill in the minus twenties. Some people don't have the sense they were born with. Men don't have a monopoly on not having the sense they were born with. Or weren't born with. Or.... hmmm, wait a minute, I'll get there eventually... maybe. Ow! I think that last sentence busted something in my brain-pan. I can get behind the Packer Bikini Girls. Perhaps I was the kiss of death to the Pack. If I had not rooted for them to win then maybe they would not have lost. Time to put away the cheese head hat. As a Cub fam. I understand your pain. You seem to be handling it in a mature manner. Wow, lots of angry bees! Dr: I don't think you should blame yourself. I wonder how many people are thinking that they, personally, brought bad luck to the Pack. It occurred to me that every time I've gone to the Harmony Bar to watch a game, they've lost. Guess where I watched Sunday's game? PoodleDoc: Personally, I don't buy into the cheesehead hat thing. It's just wrong! Although I would have been very excited had the Packers won, it's just a game, after all. Played by a bunch of rich babies, for the most part, too. Still, it's disappointing. Suzy: I think the bees were too cold to be angry. Green Bay and New York played a great game. I'm glad I watched, and I'm glad New York won.